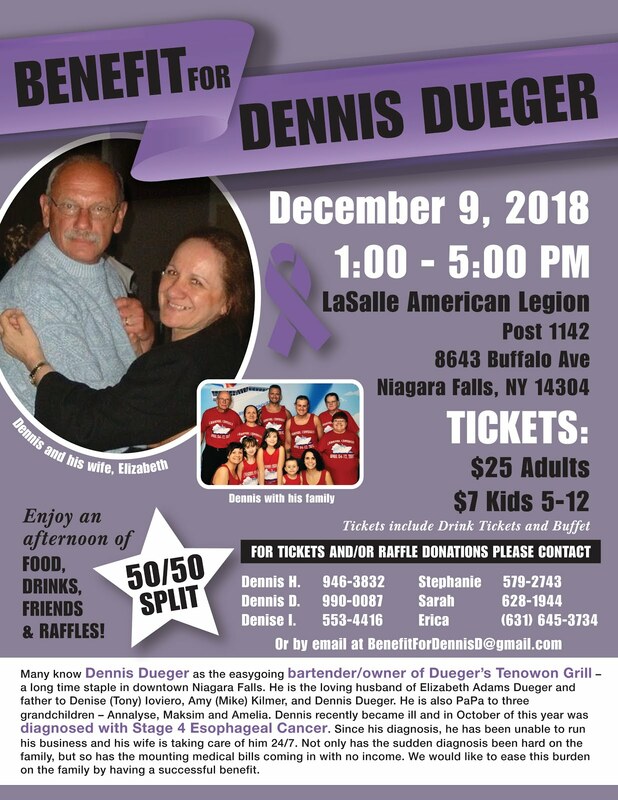 NIAGARA FALLS -- Many people in Niagara Falls knew Dennis Dueger as the easygoing bartender/owner of Dueger’s Tenowon Grill – a downtown staple for the past 50 years..
Dennis became ill and in October, diagnosed with stage 4 esophageal cancer. He was unable to keep his business open because his wife was his caregiver. Dennis lost his courageous battle with esophageal cancer right before the Thanksgiving holiday. He was the loving husband of Elizabeth Adams Dueger, father to Denise (Tony) Ioviero, Amy (Mike) Kilmer, and Dennis Dueger. Dennis was also “PaPa” to three grandchildren, Annalyse, Maksim, and Amelia. The sudden diagnosis was hard on the family both emotionally and financially. It left the Duegers with no income and mounting medical bills. Family and friends are stepping up to help this wonderful family in their time of need. 8643 Buffalo Ave. For more details, click on the photo in this article.